Any race is a spatial and tridimensional object. 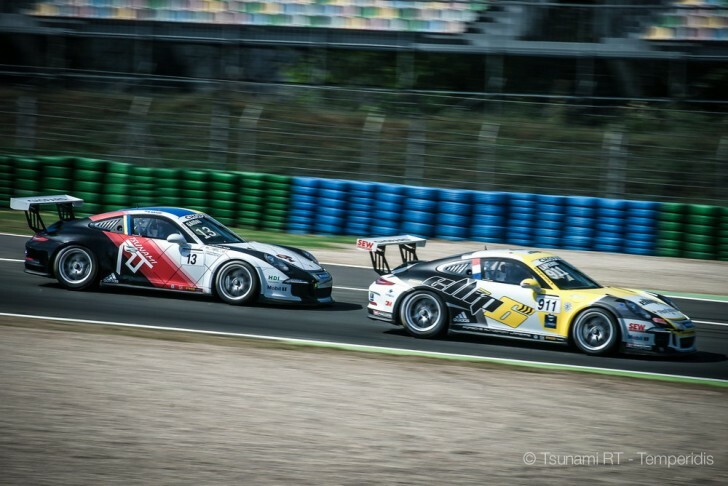 And Porsche Carrera Cup France in Magny-Cours is a perfect example of how important it is to consider the race from various points of view to estimate its plot and distinguish the event lines. Let’s take a look at the race of Saturday. Of course, we’ll consider the one of Sunday too, but a little bit later. Let it stay in result tables. So, it’s Saturday, August 29, 2015, Magny-Cours, 2:02 p.m. The starting signal light is switched off and 15 vehicles begin their first lap of the 25-minute race. Three leaders started as follows: Jousse – De Narda – Gounon. That was the way they finished in 25 minutes. Tsunami RT driver Oleksandr Gaidai started the race from the 11th starting position and finished it on the 14th position. Probably, this projection doesn’t look very fascinating. What if we look at it from another point of view? From the very beginning of the race Maxime Jousse and Joffrey De Narda drove far forward but kept fighting for the higher position on the podium: De Narda was attacking decisively, and Jousse was defending respectively. Also Jules Gounon was given no peace: Vincent Beltoise was actively seeking the former’s position, second words with deeds. Romain Monti was breaking forward from the end of the peloton with a vengeance of a tank until he came to Nicolas Marroc and pushed him out of the track. In the Division B Roar Lindland used the error of Oleksandr Gaidai and overran him. Gaidai wasn’t comfortable with the situation, he intended to overrun having seen the adequate space provided for him by Lindland and managed to put a half of the car into it. The Norwegian driver realized the mistake and tried to close the gap. The result was Lindland’s turn, and Gaidai got a new pursuer – Egidio Perfetti. A new contact and Gaidai’s car made the pirouette around its axis. All the group of the gentlemen drivers left behind, including Lindland and Daniel Diaz-Varela, gaily rushed forward, and Gaidai found himself in the position of the overtaking driver. He managed to overrun Varela, but 5 seconds of gap being behind the group three laps before the finish is an almost unsolvable task. The result is the fourth place in Division B and the 14th place overall. You can see more from above, free practices and qualifications included, where the Tsunami RT team and its driver eagerly seek the vehicle settings, and Porsche plays pranks, resists, and Gaidai has to literally push it in every turn that without any doubt burns off a lot of calories and nerve cells, but contributes neither to pleasure nor to a good result. The second race was similar, and after it Gaidai promised to the malicious car to replace all the shock absorbers in a fit of anger. The mechanics kept the threat of Gaidai. The summer is sweepingly coming to its end. Now let’s talk about Sunday. The pole position holder, Maxime Jousse, didn’t change his position again because he was absolutely satisfied with the first one. De Narda and Gounon made a photo with him on the podium again, having interchanged the places this time but still satisfied. Oleksandr Gaidai reached the bronze podium of Division B. And even the safety-car got an opportunity to drive on the track. Successful qualification is not a passport to success at all, as Nicolas Marroc thought on his third starting position gazing after the overrunning competitors – before mentioned Gounon and De Narda. Fumbled Matthieu Jaminet gave way to Vincent Beltoise, and Jim Pla overran Alexandre Cougnaud. So, the mise en scene finished with the solemn appearance of the safety car was prepared. In the sharp right turn Jaminet driving on the trajectory was already in the apex. At that moment Jim Pla approached to the turn, and the smoke from under his wheels proved that Jim had remembered of the brake pedal only a short time ago, that meant a moment before. The vertex of an angle is a point of two right lines crossing. And these lines were crossed as the trajectory of Pla who had not enough time to brake and the trajectory of Jaminet who was driving towards the coming out of the turn. As a natural result, it ended with the bounce and the appearance of the safety car (fortunately, the drivers didn’t have any injure). Meanwhile, in Division B Oleksandr Gaidai was tailgating Christophe Lapierre waiting for the mistake of the competitor. Lapierre was honestly raising hopes of the Ukrainian driver blocking the wheels and making insignificant mistakes. The safety car appeared on the track was not in Gaidai’s plans at all, but the referees rarely take into account the drivers’ considerations about it. While the humbled peloton was making sinusoids on the track, all the drivers’ conquered advantage was smoothing over, so after the restart Egidio Perfetti dashed to attack Gaidai. But he didn’t manage to repeat the maneuver of yesterday: after the contact not the Ukrainian driver but Perfetti spinned. Gaidai lost two seconds needed to restart attacking Lapierre. Perfetti was disappointed and even went to the pit lane, but then returned to the track at least to make one more spin, solo this time. Lapierre hadn’t enough time to overtake Lindland, and Oleksandr Gaidai didn’t manage to overtake Lapierre and took only the third position on the Division B podium. The replacement of the shock absorbers impressed Gaidai’s car so much that Porsche stopped playing pranks and agreed to choose direction on driver’s orders and not at its heart’s dictation. Due to that Gaidai had an opportunity to prove the principle of relativity: 35-minute race with good speed seemed much shorter to him than the 25-minute one of yesterday. And the main thing was that he began to enjoy driving, that had to be the main motivation and the goal for the gentlemen drivers according to Porsche Carrera Cup rules (it bears reminding that professional drivers do it for payment, and Division B because of love to drive).